2016 Leaf Metal US Army All-American Bowl Football continues the tradition of Leaf's gridiron sets that are centered around the US Army All-American Bowl, but this time with a chromium finish. Each box promises eight autographs from some of the top names in high school football. Only containing signed cards, each hobby box will yield several of the design options. Among the choices are base Metal Autographs, numbered to 50 copies or less. There are also several limited parallels including Alternate Flag. The Selection Tour Autographs (#/50 or less) offer hard-signed options and more rare parallels like Inscriptions. Rounding out the choices, Patch Autographs (#/35 or less) are reserved for the top players and skill positions and feature quality game-worn patches and sticker autographs. 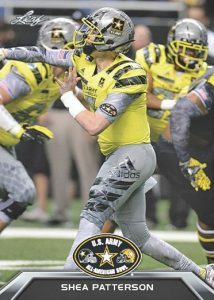 Unlike previous years, every participant in the event signed for 2016 Leaf Metal US Army All-American Bowl Football and the game was played on January 9, 2016 at the Alamodome. 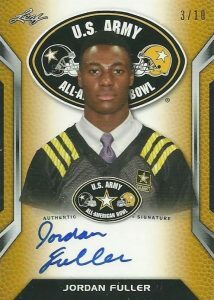 The full player roster can be seen on the U.S. Army All-American Bowl website. The annual high school all-star game boasts major names in college and NFL circles as alumni, including Andrew Luck and Odell Beckham Jr. There are also base cards for the set but they are not part of the hobby offering and are only found through select online distributors. 2016 Leaf Metal US Army All-American Bowl is limited to 199 cases. PARALLEL CARDS: Silver #/25, Yellow #/10, Red #/5, Purple 1/1, Printing Plates 1/1. PARALLEL CARDS: Blue Prismatic #/50 or less, Purple Prismatic #/25 or less, Pink Prismatic #/20 or less (Card #33 - #/7), Black Prismatic #/15 or less, Green Prismatic #/10 or less, Red Prismatic #/5 or less, Gold Prismatic 1/1, Gold Super Prismatic 1/1, Printing Plates (Promotional). FLAG ETCH PARALLEL CARDS: Blue Prismatic #/12, Purple Prismatic #/10, Pink Prismatic #/7, Black Prismatic #/5, Green Prismatic #/3, Red Prismatic #/2, Gold Prismatic 1/1, Gold Super Prismatic 1/1, Printing Plates (Promotional). See specific print runs with the full spreadsheet. PARALLEL CARDS: Silver #/35, Gold #/20, Red #/15, Blue Spectrum #/10, Silver Spectrum #/5, Gold Spectrum 1/1, Gold Spectrum (FB) 1/1, Printing Plates 1/1. PARALLEL CARDS: Silver #/35, Gold #/20, Red #/15, Blue Spectrum #/10, Silver Spectrum #/5, Gold Spectrum 1/1, Gold Spectrum (FB) 1/1, Printing Plates (Promotional). PARALLEL CARDS: Silver #/25 or less, Black #/15 or less, Yellow #/10 or less, Red #/5 (Cards #ATA-BE1 and #ATA-KC1 - 1/1), Printing Plates (Promotional). Not a bad product at all! One big question though: do you know why they are allowed to make these cards? I feel like they would violate some kind of NCAA rules. Thanks! 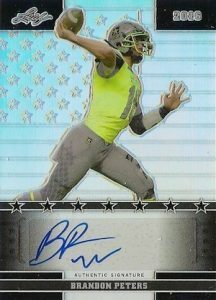 2015 LEAF ARMY ALL AMERICAN BOWL FOOTBALL HOBBY BOX Sam Darnold Drew Lock RC ??? 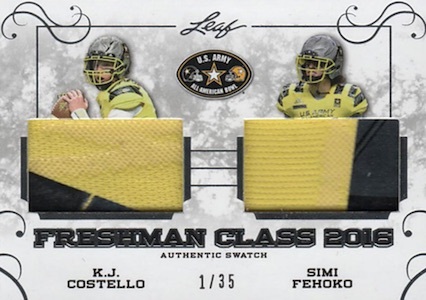 2015 LEAF U.S. ARMY ALL-AMERICAN BOWL FOOTBALL HOBBY BOX - Darnold Autos? 2016 LEAF METAL ARMY FOOTBALL HOBBY BOX DK METCALF SHEA PATTERSON AUTO #D RC ? ?